Earlier this year during the 2014 Consumer Electronics Show we saw a few new entrants into the wearable tech space, and then this week during Mobile World Congress, the floodgates opened. We finally saw how Sony's SmartBand will function, a new introduction from Huawei, heard a little bit about LG's new smartwatch and more. 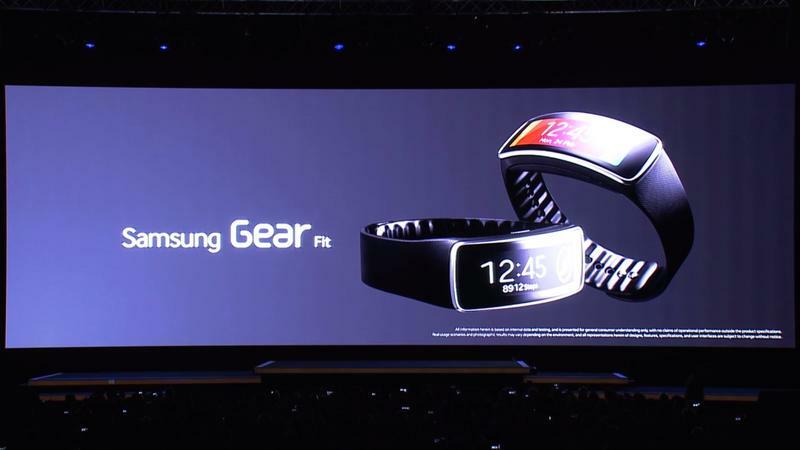 Samsung came to the show packing heat, however, and unveiled three new wearable devices. One device, in particular, appeared to steal the entire show – taking attention away from even Samsung's brand new Galaxy S5 flagship. Following the introduction of the Galaxy Fit – a new device that will launch in the coming weeks with a curved AMOLED display, a heart rate sensor, and more – the gadget quickly became the topic of most conversations. There's a terrible cliche at trade shows that's often used as an ice breaker during meetings: "What's the coolest thing you've seen at the show so far?" The answer, from most people I talked to and coming from my own mouth, was the Gear Fit. It wasn't the Galaxy S5, the Gear 2, the Gear 2 Neo. It wasn't any other smartphone or tablet I saw on the showfloor – it was a gadget that will cost less than Samsung's smartwatches and far less than any other gadget on the show floor. For me, the gadget is compelling because it provides some smartwatch notification support – you can see incoming calls and messages – but also because it has a design unlike anything we've seen in the space so far. It has a futuristic allure – this wristband gadget with a bright and colorful touchscreen display that can tell me my heartrate, when a call is coming in, how many steps I've taken and more. It's almost like something out of a science fiction novel, but it's very real, tangible and here now. It stole the show – or at least the buzz during the show – because it was something different. Are we already tired of smartwatches? No, I don't think so, but maybe we're bored with the design – a square screen and a medicore UI most of the time. As for fitness bands, most are regular rubber or plastic strips without a display – the FitBit Force had a small one, though it was just recalled and wasn't as interactive or unique as Samsung's Gear Fit screen. It wasn't just the show floor buzzing about the Gear Fit. When I returned home, I ran into a friend in the lobby who had been watching our coverage during Mobile World Congress. The first thing he wanted to hear more about was the Gear Fit. Again, it wasn't the Galaxy S5, Samsung's new smartwatches or any other product introduced during the show, all of which offer more features. I think the attraction is very telling: there's a desire for unique design. Watches are great – I've worn them my whole life, but everyone knows what a watch is. Rarely, I think, are you going to get stopped in the street by someone who wants to see your watch. The Gear Fit looks totally different, is the first such device with a curved AMOLED touchscreen, and I think that's what makes it compelling. As the industry moves toward a wearable focus, I think we'll see the most attraction to devices that not only function better than other devices, but ones that also put a focus on standing out and looking different. Wearables, like smartwatches, are going to be as much – or more – about fashion as they are about function, and I think the winner in this space over the next few years is going to be the firm that succeeds at both. So far, Samsung looks to be on the right track.